In the history of British sci-fi TV, Quatermass might have had more intellectual depth and Doomwatch more topical relevance, but neither of them ever had a hope of matching the longevity and cult appeal of Doctor Who. The sceptical observer might assume that the show's rickety sets, absurd space monsters and rather fey man in a long scarf - all crammed inside a telephone booth, if you will - would be an instant turn-off for anybody born after the end of post-war rationing. But thanks to the fantastic networking capabilities of the internet, new "Whovians" keep breeding like an alien plague. Endless reruns on cable and satellite TV are already keeping the Doc alive, but it looks like he's due to be born yet again in a new feature film. Since no long-lost episode, morsel of trivia or piece of merchandising memorabilia is too insignificant to merit further investigation, the rumours of a new full-length Doctor Who movie to be made by the BBC have been minutely dissected by the Who cognoscenti. Long experience has taught top Doc-spotters to treat stories of this kind with extreme caution. However, there seems to be something in the wind, whatever its final shape turns out to be. Stories of a new Who film project appeared in the press during 1999, suggesting it would be directed by Paul Andersen - with some involvement from distributors Artisan Entertainment. That has apparently bitten the dust, but BBC Films now looks as though it's inching closer to committing itself to its own movie. Whiskery Beeb supremo Greg Dyke is believed to have waved through a budget allocation of 15 million quid. Casting is rumoured to have been entrusted to Philip Hinchcliffe, experienced producer of the TV series, while possible directors include John Glen, who has lensed a long list of Bond movies as well as Gerry Anderson's Space Precinct, Sidney J Furie (The Ipcress File and Superman IV), film and TV veteran Michael Apted, and erstwhile pop video director Russell Mulcahy. The smart money, if there is any such thing in cases as nebulous as this, has been placed temporarily on Mulcahy, but may have moved on by the time you read this. While Ephraim Katz's Film Encyclopedia comments acidly that "his background in music videos has been evident in his few less-than-refined feature films", Mulcahy's best-known celluloid excursion remains Highlander, that farcical farrago of a time-travelling immortal Scotsman (confusingly played by French matinee idol Christopher Lambert) engaged in violent hand-to-hand combat with his magical sword on the New York subway. Or something. Still, we know that Mulcahy has no fear of making himself or his actors look ridiculous - he was also responsible for several Duran Duran videos in the 80s, and apparently has never felt any urge to make a public apology - so from that point of view he may be the perfect man for the job. Cybermen, Daleks, enormous man-eating woodlice and giant brains made of cellophane and lit up with Christmas fairy-lights would hold no terrors for Big Russ. Except that history tells us that series which have become cultish viewing on British television very rarely work on a cinematic scale, whoever is actually in charge. The recent Hollywoodisations of The Saint and The Avengers are two perfect specimens of the way the wit, whimsy and campness of the originals has evaporated by the time they're uncrated out on the West Coast. And of course if they cast Val Kilmer as the Doctor, it'll be as good as putting Police Line - Do Not Cross tape around every cinema in America on opening weekend. However, Whovians can at least take some comfort from the fact that Val hasn't so far been mentioned in connection with the project. Nor has Paul McGann, who became the eighth Doctor Who when he starred in the less-than-auspicious 1996 Who movie. On the other hand, grizzled ex-telly gumshoe Tom Selleck has been, although the cyberspies on the Dr Who newspages deem him an unlikely candidate. Meanwhile, some comments made by Russell T Davies, author of the Dr Who novel Damaged Goods as well as of Channel 4's Queer As Folk (which features Vince Tyler, the Manchester supermarket manager who also happens to be a Dr Who fan) have merely clouded the issue further. Davies was rumoured to be involved in writing the new movie, but he denied it in an interview with SFX Magazine. "It's so not true", he confessed. "I wish!" And, according to Davies, Mulcahy wouldn't after all be sitting in the director's chair. He claims it's all a misunderstanding, stemming from the fact that Mulcahy is actually directing the American remake of Queer As Folk. But whatever happens in Hollywood, Who-mania continues to bust out all over. Russell Davies could conceivably be involved in developing a new TV incarnation of the series, possibly starring Alan "no relation" Davies in the title role, while Radio 4 is preparing a Who project for early next year, featuring Stephen Fry, Sylvester McCoy and Sophie Aldred. Whatever Gordon Brown might think, an old college scarf will never let you down. Caption: Doctors in the house... 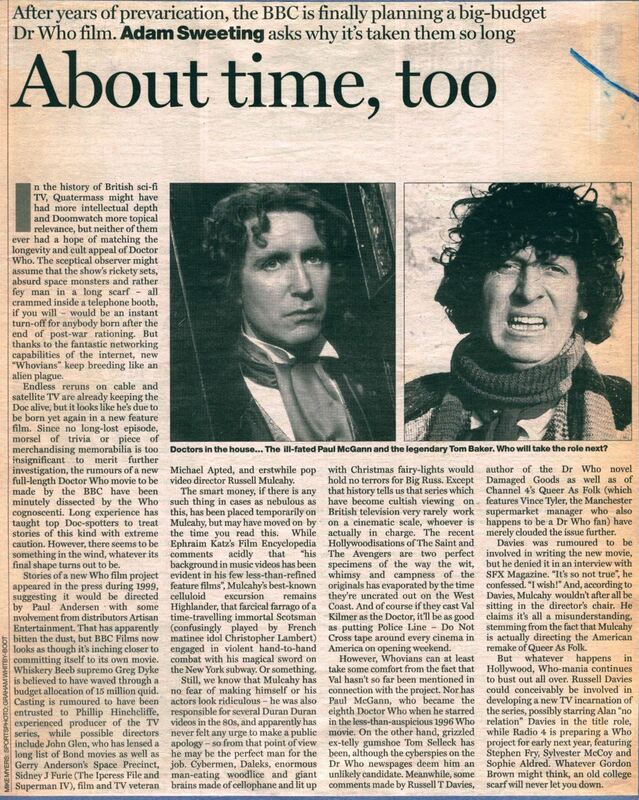 The ill-fated Paul McGann and the legendary Tom Baker. Who will take the role next? APA 6th ed. : Sweeting, Adam (2000-06-14). About time, too. The Guardian . MLA 7th ed. : Sweeting, Adam. "About time, too." The Guardian [add city] 2000-06-14. Print. Turabian: Sweeting, Adam. "About time, too." The Guardian, 2000-06-14, section, edition. This page was last modified on 27 January 2016, at 23:50.